After chatting up a fellow mom recently about how she manages to get three kiddos out the door flawlessly on time, it became apparent that planning two tiny things the night before was the key. Instead of plunking down on the couch and binge-watching shows after the kids go to bed, she 1) plans for breakfast and 2) lays out her own outfit for the next day after the kids’ outfits are of course already chosen before they even go to bed… with their help. Totally understandable on the picking out clothes. So many choices! The groans and moan of, “I have nothing to wear! !” This is an easy AND smart thing to do. Give two to three choices but a decision must be made and laid our the night before. No morning changes (which means look at he weather ahead of time). 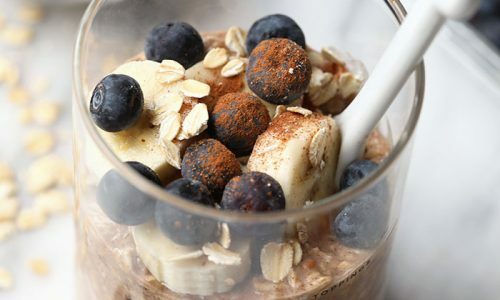 However, if you’re not a shake person or just want a change, another healthy make-ahead breakfast option that will help you feel good about winning the morning game (and also approved by our Super Mom friend) is Overnight Oats! We love this super breakfast not only because it’s so easy to make ahead for the whole week, but you can’t get too tired of them because the recipe combo options are endless. They’re a great source of fiber, which keeps you full all morning, and when paired with the combo options below, you’re getting even more nutrients! You just toss some old fashioned oats in a mason jar or pyrex dish. 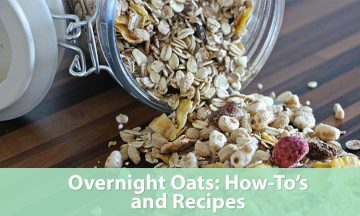 Use these instead of quick oats or steel cut ones. It’s a better consistency- not too chewy and not too smushy. Throw in some kind of milk. Any kind will do: plant-based, whole, skim, etc. Load up on the toppings for your own unique flavor combo. Wake up and eat them warm OR cold in the crazy morning rush or take it to go. NO prep or cleaning up! If you want some insider tips on making them or have more questions, check out this post from Hurry The Food Up. Instead of reinventing the wheel, we scoured the web for our top 3 favorite combos! Maple syrup meets bananas and blueberries. Use almond or coconut milk, and this is a great vegan option, too! If you have a sweet tooth, this candy bar inspired breakfast will be a fave. 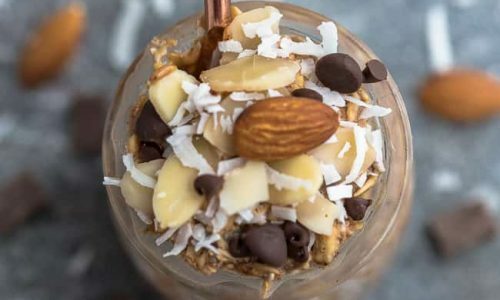 With almond milk, almonds, and coconut flakes, you can either use cocoa powder to add in that chocolatey punch, or use a chocolate protein powder like Juice Plus+ Complete! This post has it’s own oat recipes 5 different ways, so check them ALL out, but we like the good ol’ classic berries and cream version! Berries of any kind like blackberries, strawberries, and strawberries mix with creamy Greek yogurt and chia seeds, making this full of antioxidants. So what do you think? Which is your favorite flavor combo, or which new flavors are you going to try next? Banana chocolate chip? Carrot cake? Endless possibilities await! 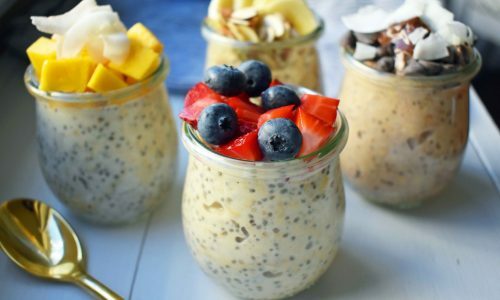 Eating overnight oats might not be a complete life changer, but we bet it will save at least 20 minutes in the morning, and with three kiddos and a husband to feed, that might be!